Oil prices are getting a boost this morning following Trump’s announcement yesterday of sanctions on Venezuela. Markets have almost completely recouped yesterday’s losses. Crude this morning is trading at $53.59, up $1.60 from yesterday’s close. Fuel prices are also making large strides, though not quite back to where they began the week. 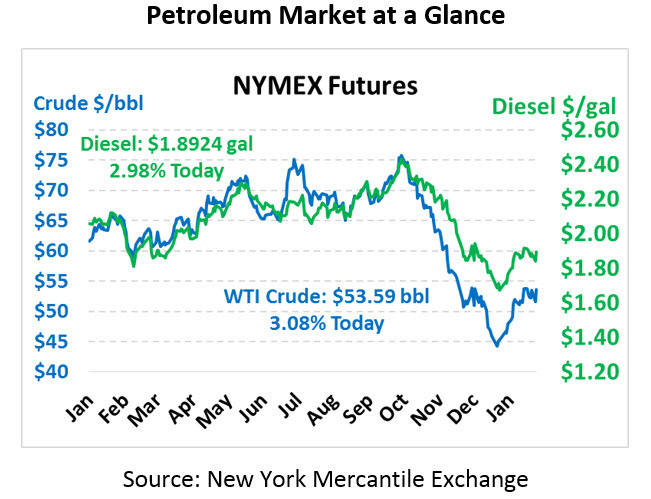 Both gasoline and diesel prices slid well over 5 cents yesterday. Diesel prices this morning are trading at $1.8924, undoing most of yesterday by gaining 5.5 cents. Gasoline prices are lagging behind slightly, trading at $1.3699 after rising just 3.7 cents. Saudi Arabia yesterday indicated they expect to produce well below their quota for February. Allowed 10.3 MMbpd of output, the country is targeting 10.1 as they attempt to balance oil markets. They also expect global demand to pick up towards the end of Q1, rising as western countries move into their summer demand season. In Libya, production remains well below potential as the largest oil field, El Sharara, remains closed due to armed protesters. Libya’s National Oil Company expects this 315 kbpd field to remain offline until protests subside. Trump yesterday imposed sanctions on Venezuela’s main oil company, PDVSA, prohibiting US companies from doing business with the oil giant. The move cuts off foreign capital to Maduro’s government, which has long drawn its funding from oil revenue. Venezuela will still be able to sell its oil, but will have to reroute its supply to Asian countries at a steep discount. American refineries can continue processing existing Venezuelan oil, but cannot make payments to PDVSA for the oil. The move further aligns the US with Juan Guaidó, the leader of Venezuela’s National Assembly who declared Maduro illegitimate and is pushing for a new election. Trump and Pence have already recognized Guaidó as the de facto head of state until an election can be held, and other countries have followed suit. Without access to revenue, Maduro will not be able to afford running the state, which could tempt the military to abandon him – the ultimate requirement for regime change. Trump Advisor John Bolton said the administration has not ruled out a military intervention to facilitate Maduro’s descent from power. 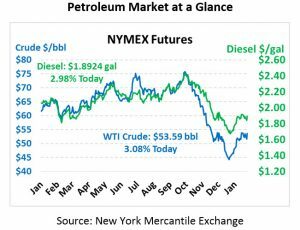 The move puts at risk roughly 500 kbpd of American oil imports, or 3% of our total national demand. The Trump administration argues that sanctions should not have a significant adverse effect on prices since we already have abundant supplies of oil and fuel. Trump is also reportedly considering a release from America’s Strategic Petroleum Reserve to offset lost supplies.